"The Voice in the Clouds." This painting ended up being the culmination of several ideas. First of all, when I painted "the Storm and the Egret" I just fell in love with the clouds that I painted. But at the same time I really wished that the canvas for that painting was longer and more rectangular so that I could see more of the clouds. So for this painting I decided to make it very skinny and narrow. And I ended up making it 6 feet long but only one foot high. And as I got to thinking about clouds, one night I was reading my Bible in Deuteronomy chapter 1 and I came across the story of when, at a time when the Israelites were not trusting God at all, Moses reminded them about how God lead them out of slavery using a pillar of fire at night and a pillar of cloud by day. That must have been scary for them as they left the world that they knew without knowing where they were going. But, at the time, they chose to have faith in God and follow him. They chose to trust and not be afraid. But then they so soon forgot about the miraculous way that God had saved them and stopped trusting him because as they wondered around the desert for years, not knowing where they were going, they began to become afraid. This is a choice that we all have- to trust or to fear. 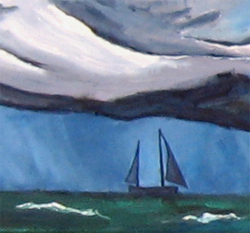 So as I painted this painting I wanted to show a boat in a storm sailing towards the lightning. The people in the boat have the very same choice that the Israelites and later, the disciples did: To be afraid or to realize that God is in the boat with you, guiding you towards your destiny, not necessarily out of the storm. But none-the-less, he is with you. See this painting in progress here. risky & unfeeling act to send it out into the world."